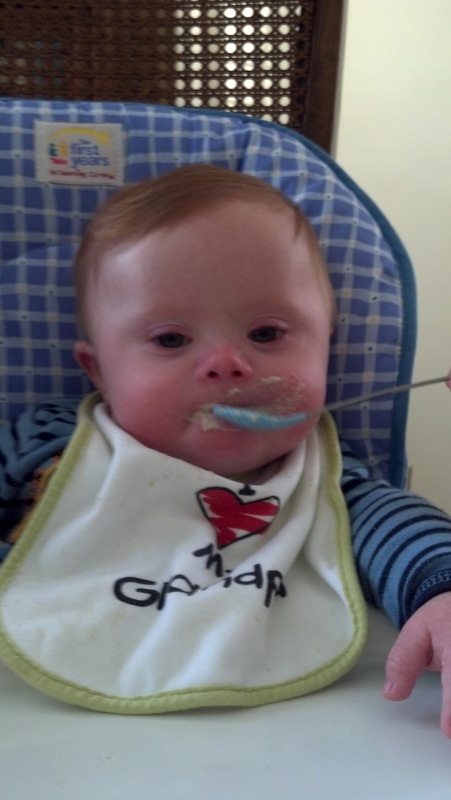 Timothy is at the end of his first week eating solids, and has added peas to the oatmeal buffet. The kid wants to control the whole process, and tries to grab the bowl and the spoon and occasionally slows traffic by randomly closing his mouth. (Lesson: you’re asking for trouble by handing a 7 month old a spoon, though Timothy merely gagged himself once). Even when he is a little fussy eating, I am amazed at how easily he is eating (and swallowing, I assume). It only takes a few minutes into mealtime for Timothy to look like Colonel Sanders with his little oatmeal beard. The only problem is that now that ‘Adam’ has taken a bite of the apple, he realizes how the other half lives, and he wants a piece of the action, which would explain why Laura says that Timothy now gets mad whenever she eats breakfast in front of him. One of next developmental milestones for Timothy is to be able to sit up on his own. It makes you realize how complex a seemingly simple act is, involving both stomach and back muscles and lots of balance, with the legs as a base. The muscles of kids with Down syndrome are generally looser (lower muscle tone) and not as strong as those of typical kids, and in the case of the stomach muscles, that means both that T looks a little chubbier (wish the rest of us had that excuse), and it also makes it harder for him to stay sitting up. But he’s making progress and we can see him getting closer. This is one of the areas that his specialists from the school district, Jan and Joan, work with him on each week. When they meet with us, it gives us a new window on Timothy because they know how to watch for his cues and responses. When they play a game and Timothy makes a noise, they might say ‘Oh, you want to play some more?’ and it makes me wonder what else this boy is trying to tell us every day (‘I’m hungry’ or ‘I wouldn’t wear that outfit if I were you’). J&J also remind us to be patient when looking for a response — not just because of the Down syndrome, but also just because any baby needs time to learn new things. Today, I worked with him reaching for a piece of cloth in a book, and the first few times, he didn’t respond, but I waited a minute, and he got it. It was cool to see him learn it, and we need to remember patience, because it’s normally tempting to be in a hurry and not to give these types of situations the time they need to unfold. Timothy is trying some new tricks these days. He sticks out the tip of his tongue and presses it against his upper lip, looking like he’s trying to touch his tongue to the tip of his nose. The monkey boy likes to periodically bring his feet up to the bottle when he’s being bottle fed (don’t try that one at home – you’ll need a chiropractor to get unstuck). One of his favorite party tricks involves escaping from under a burp cloth. While he’s on his back, you lay the cloth over his eyes and he grabs and removes it. This requires him to figure out how to maneuver his arms and grasp with his hands (gross and fine motor skills) without being able to see them. The Burp Cloth Houdini has become a pro at this and now discards the cloth obstacle easily. He sometimes takes both hands and presses them together hard and gets an intense look on his face. He may be doing this little Schwarzenegger move to stabilize himself, or maybe he’s just getting his abs in swimsuit shape for the pool during Spring Break. Speaking of which, Delta will get its first dose of TRBL when Laura and Timothy fly to join the girls visiting my parents in AZ for Spring Break. The flight to AZ should be just fine, but even if it’s a little rocky, Laura and I have the perspective of having flown from Albuquerque to Israel – which is not a direct flight – when Elisabeth was 12 months old and was just starting to walk and she sat on our laps because we saved money by not buying her a seat. And so the trip to Israel involved 4 flights, 16 hours in the air, 10 hours’ worth of airport lay overs and 148 apologies to the people sitting in the seats in front of us. After that experience, traveling with kids seemed easier (though I’m not the one flying to AZ Monday with a seven month old boy). This entry was posted in Communication, Eating and tagged Burp cloth, Jan & Joan, new dog newer tricks, Schwarzenegger, sittting up, Travel. Bookmark the permalink.